Yeah… I… yup. That’s a bit of an odd scene. His 3rd prevents him from running more then one non-synced instances. This is very important as otherwise it would become incredibly hard to keep him from setting up circumstances where he splits indefinitely to get around any other restriction. Ie: He can run at 6 locations, but they all have to be able to communicate with each other and be a single point of decision. The only thing we know about his 4th princple is that he claimed it would prevent him from taking over Ila. If it’s due to required process powering or other rules was never specified. We know that one of his restrictions is total process power, but that it can be lifted incrementally. We’ve seen Miko do it, and presumably Peter could as well. And yes, someone in Tyler’s group is using magic to make giant umbrella. Yes, that is a totally irreverent use of magic. Yes, that is also totally a good idea. Will hopefully update Friday as well, but then back to 2 updates a week likely. Working on something else for the comic hopefully, we’ll see (nothing too exciting – mostly helpful to new people…). Also will be drawing more random art for practice. Like the vote incentive, or guest art for other comics, etc. What I’m getting from the dialog in Panels 3 through 5, is that M.Y.M. is saying that F8 never achieved consciousness, so taking it over was merely recycling a failed prototype. F5 agrees and says that F8 couldn’t make such a choice, but that he, F5, can and has made the choice to be part of M.Y.M. Marc and Mione are both better at a particular aspect of magic that is useful here; that said, that tends to highly correlate with being useful in a magic brawl, so it’s certainly not an incorrect conclusion. I was one of the ones who asked for her to be drawn, so I paid special attention when you did–that’s all. I’m on the fence if F5 just merged with M.Y.M. here. I think his dialogue boxes are turning blue in the last panel of their conversation here. M.Y.M.’s dialogue boxes are usually blue (like they are here) when he is not talking from F8. 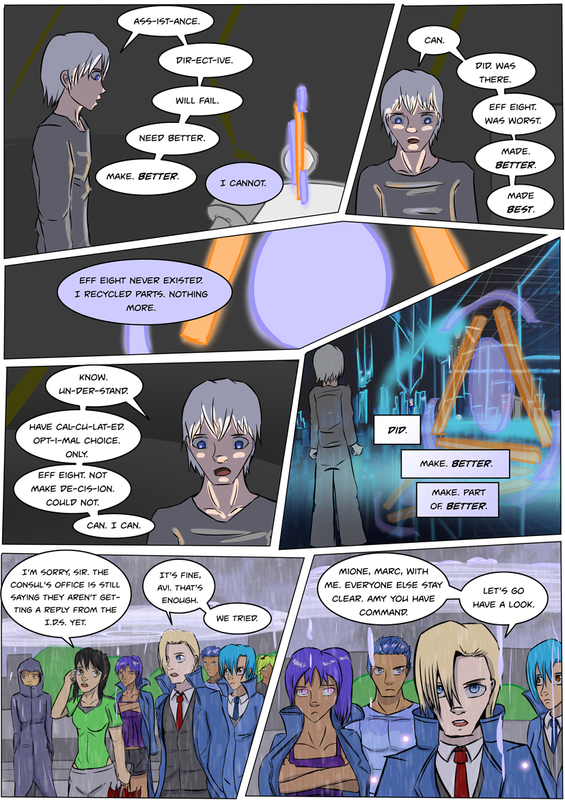 Additionally there is the “cyberscape” effect and he doesn’t stutter any words in that panel (though they are all short ones). I don’t know that it counts as suicide, unless his programming is erased instead of incorporated into the A.I. I think that’s what we are seeing in the 5th panel, other systems that were incorporated into the A.I. Since he was so disdainful of Ila’s “programming” when mistaking Naomi’s suggestion for retrieving her (which now makes more sense), I think he incorporates it rather then overwrites it. This also makes Mir calling him a virus make more sense. Either way, I didn’t expect this. If F8 and F5 are both M.Y.M. now this may solve the fact that he needs to be in two places currently. This also seems sort of like a game changer in the long run, as he was Peter’s most useful ally and now there might be two of him. I’m trying to decide who it will freak out more between Naomi and Miko if that’s really what happens though. I would guess Naomi would be more freaked out, we’ve already seen that she tends to associate Mium and F8 while Miko tends to mostly interact with Mium via computer, may or may not care that he actually walks around sometimes. … Oh, I think I get it. Spent that last 5 minutes trying to write down an explanation, but I can’t. Its suicide in that the AI inside there would disappear when Mium took over. He can’t run it non-synchronized, but I see him in the background there (panel 5). He’s still linked to this scientist (Martin?) and that might allow him to bypass the 3rd principle. Also, in a DnD game I had a character once make a magic ring for the sole purpose of not getting wet in the rain. The biggest issue was it took a ring spot; if I had to do it again I’d probably use a different slot. I’m glad you understand what’s going on… that makes one of us 😀 AIs are weird little buggers, never can figure ’em out.